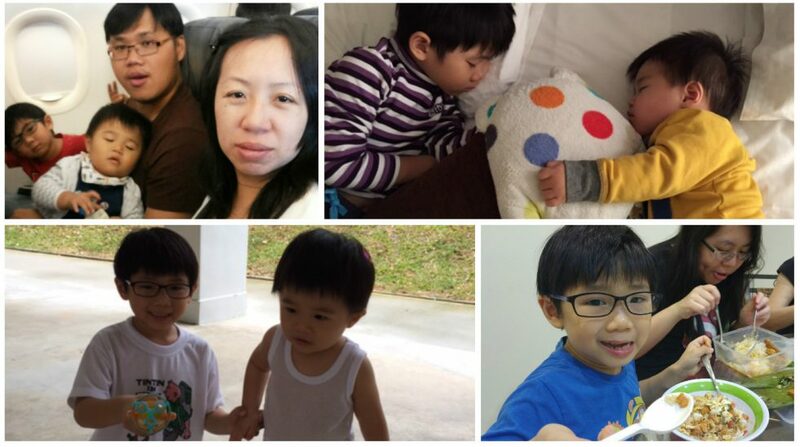 2 weeks ago, we went to Nom Cafe at Macpherson Community Club to celebrate Lee Lee’s birthday. 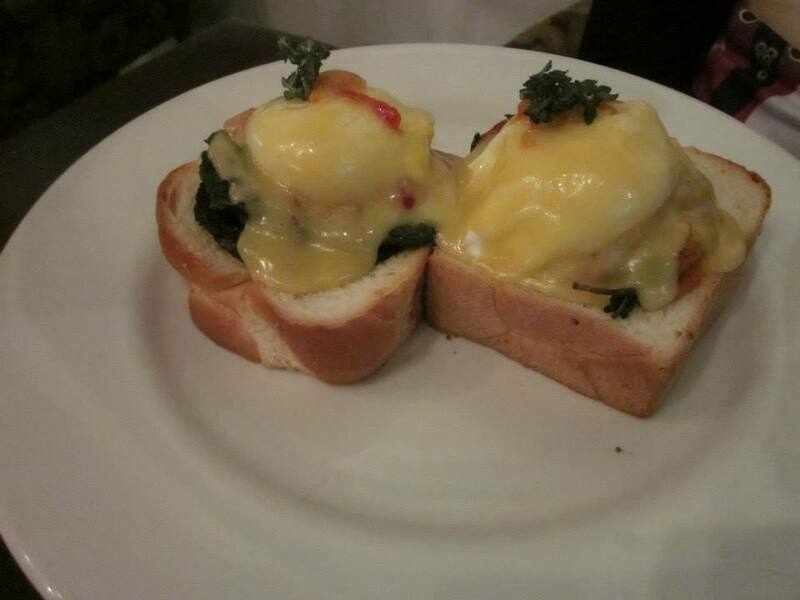 It is quite a cosy place which serves decent food at reasonable prices. There is also a small play area for kids with a slide. Really love kid friendly restaurants like these as kids can get really restless sitting at the table for too long. Just a simple small play area like that is really helpful for parents to chill and chat and the kids have something they enjoy doing too. But the highlight of Nom Cafe to me is really their rainbow cakes. They have a variety of rainbow cakes …… Chocolate rainbow, salted caramel rainbow, rainbow cheesecake. Rainbow cake is usually just pretty to look at but just simple sponge cake layered with cream between each layer. But the rainbow cakes here are so much more exciting and delicious and they look good too. We got a slice of the salted caramel one and the cheesecake. 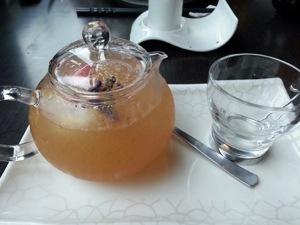 Both were really pretty and tasted good too. Luv it when food looks good and tastes good too! Worth every calorie and and cent too 🙂 And the best is when it’s eaten in the company of lovely people! Luv birthdays……a time to gather and explore new places to eat. I love froyo! It started out as a craving during pregnancy. When I was expecting Ezra, I was crazy over frozen yoghurt and would eat it 2-3 times a week sometimes. Most of the time, I got my froyo from Yoguru. 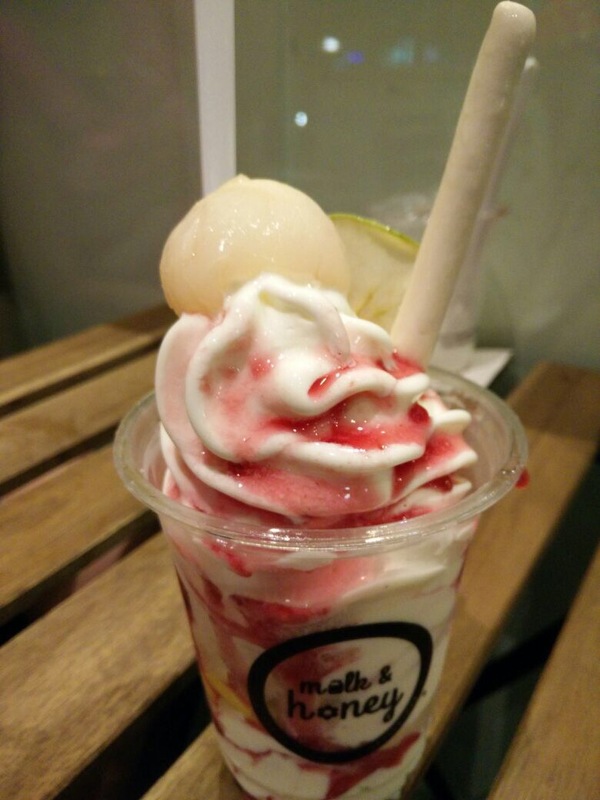 It has been some time since I had froyo. 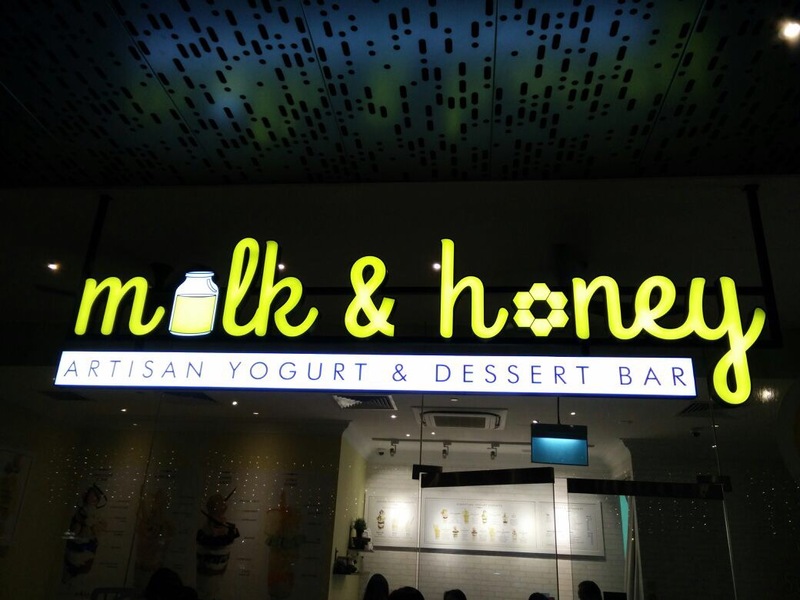 I have been eyeing this yoghurt shop – Milk and Honey Artisan Yoghurt at OneKM Mall near my in-law’s place every time I go there and it has been calling out to me. OneKM mall is about the only mall I can go on my own for a short trip while the baby is sleeping or has just had his milk since it is conveniently located next to my in-law’s block 🙂 Finally decided to give it a try yesterday. After dinner, the whole family went down for yoghurt. The place was packed and we had to wait a while for a seat. We customised a chocolate parfait one. 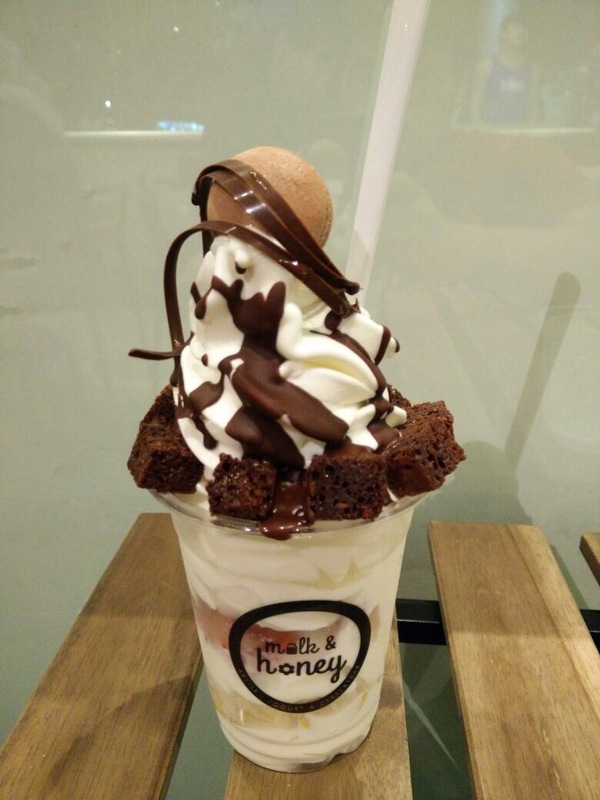 Yes, you can customise your froyo and there are interesting toppings like macarons and brownie and of course the usual fruity ones. And it’s not just choose one topping … you have to choose topping, decoration, sauce, top tier, middle layer and a base. Lots of choices for each one. We chose macaron for toping, chocolate for decoration, chocolate sauce, middle later banana and base strawberry. My mum-in-law ordered one of their signature yoghurt parfaits on the menu – tropical zest. We had to wait for about 15min for our froyo by which time, we managed to get a seat. It was definitely worth the wait! Really yummy stuff. I would definitely go back again, especially since it is so convenient 🙂 Have to probably stop myself from going too often cos it’s a little pricey. $7.80 to $9.80 for the yoghurt parfaits. Japanese is my all time favourite and was really glad to discover these 2 restaurants which really whip up yummy Japanese food. Best part is they are both in the east, so I don’t have to travel too far for good Japanese food. Both places can be crowded and it’s best to call beforehand to make reservations. I had Teppanyaki pan fried beef and it tasted amazing! The rest of the food around the table looked really good too, especially the sashimi, but will have to abstain from that for now. 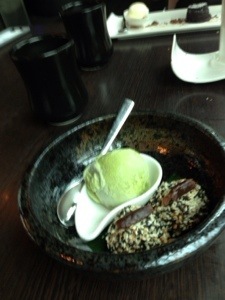 We went to Momoya for my mum’s birthday celebration this year. My sister has been here before but it’s my first time. My expectations were not high as the reviews I had read online were not impressive. We all decided to go for the buffet since there were so many of us and we could try a variety of food. We ordered an assortment of dishes and I was pleasantly surprise that that most of the dishes we tried were quite good. 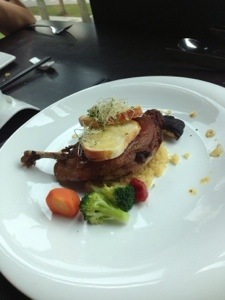 In fact, I really enjoyed the dinner. The food did not take long to come too, unlike some other Japanese buffets I have been to. 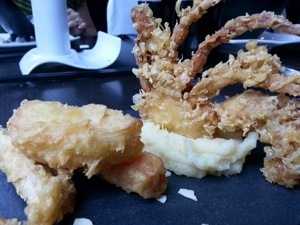 Went for our first lovely restaurant meal of the year last Sunday (5 Jan) at one of our favourite restaurants – Ichiban. Had been unwell for the past 2 weeks and fish soup/noodle soup/porridge have become my staples. 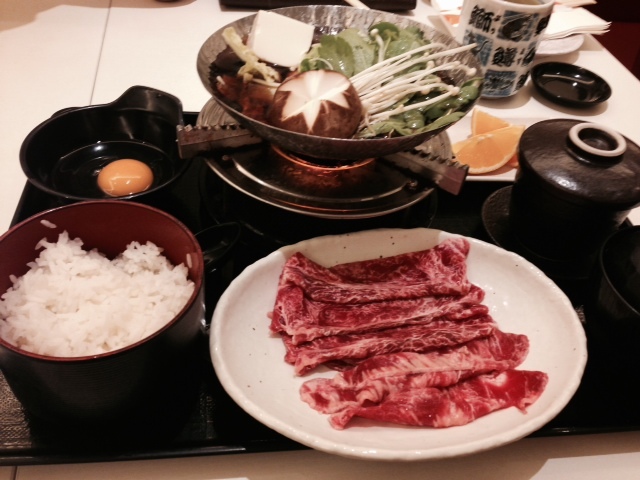 So, to me, this Sukiyaki I had at ichiban was like such a treat. Still battling a slightly sore throat and cough, so decided to still go with the soupy option. But I really enjoyed this meal soooooo much. It was warm, comforting and full of flavour. I have been here many times and eaten this dish many times. But somehow, it really felt exceptionally good today. A nice break from the fish soup/noodle soup/porridge! This is our second time back at Dozo. The first time was on Valentine’s Day in 2011. Obviously the food was good enough for us to decide to come back a second time. It was the birthday boy’s choice. He has been wanting to come back again for some time and we finally had the chance. This time we came for lunch. 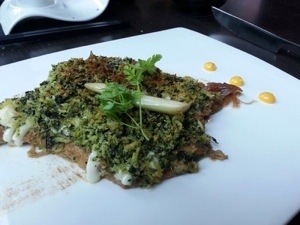 Dozo serves French-Jap fusion food. For lunch, they serve a 6 course lunch and for dinner 7 course. 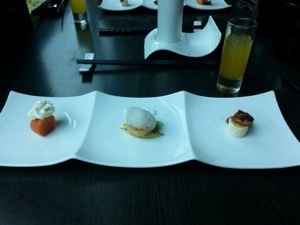 Diners get to select from various options for each course. Here’s a glimpse of what we ate. 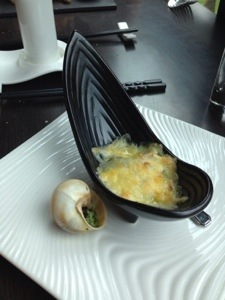 My favourite for the night were the escargots and the crab bisque which were really yummy and rich in flavour. 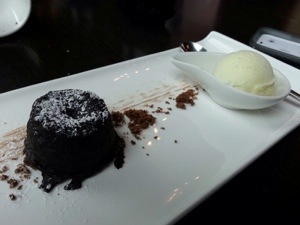 Ivan of course ordered the lava cake which he loves and which has since set the benchmark for all other lava cakes! 3rd course: I chose Crab Bisque and Ivan chose Clam soup. Fourth course: My duck and his Kurubuta Pork. After that, we went to catch Thor:The dark world. Pretty much enjoyed the movie though it was more of Ivan’s kind of movie. 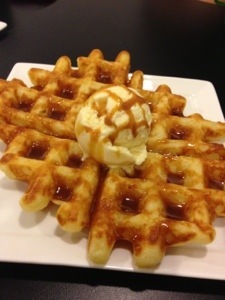 I am not particularly interested in waffles ….. but these are really good! Shane and Anne brought Lee Lee and me to D’zerts Cafe near Simpang Bedok to try them after Saturday Service. As it is more of a dessert place, so we had dinner first at Big Eater restaurant (just next to it) which sells zi char and is pretty good too. It was light and slightly crispy. And I love the salted caramel sauce. I never really liked waffles but I love this waffle!! Worth every single calorie!! It was a relaxed night for me too, even though Ivan was not around, thanks to Shane and Anne who helped to feed Daniel and entertain him! 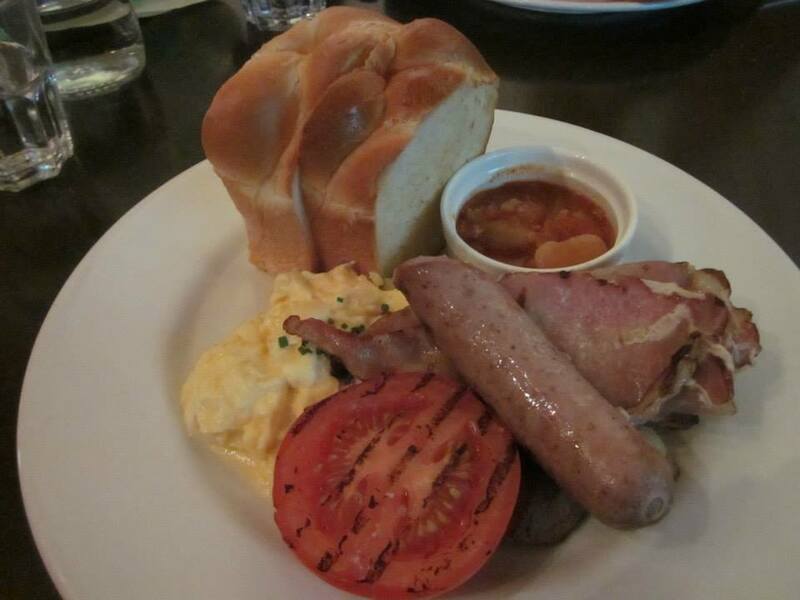 Had a lovely brunch on a lovely midweek public holiday with a lovely couple at a lovely restaurant! 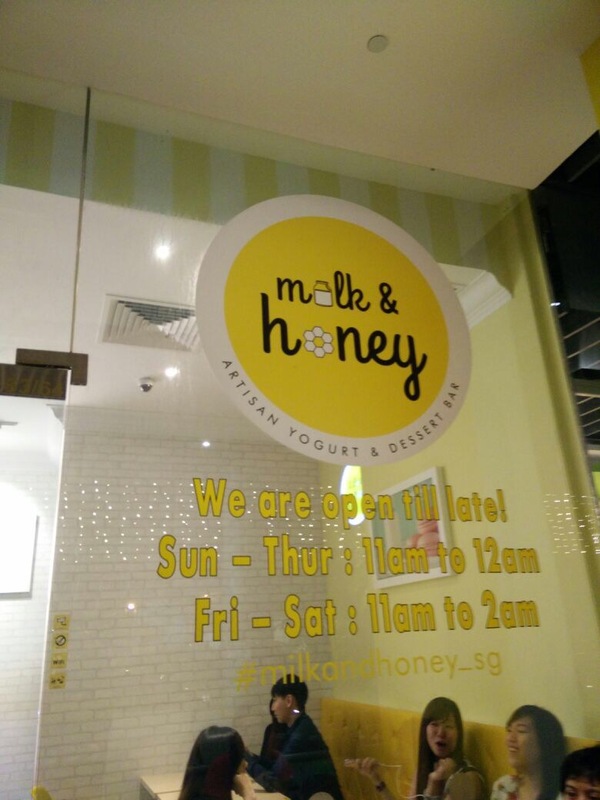 Was my first time at Wild Honey. Have read good reviews of the place but never been there. There was a queue when we got there at about 1030am. It was quite cool as they had an electronic booking system and they will personally call you when the table is ready. 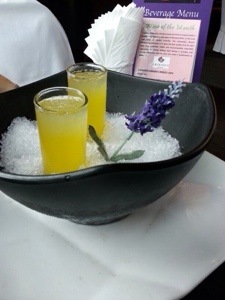 We waited slightly over 30 minutes before receiving a call informing us that our table was ready. It’s certainly well worth the wait. I enjoyed the food. 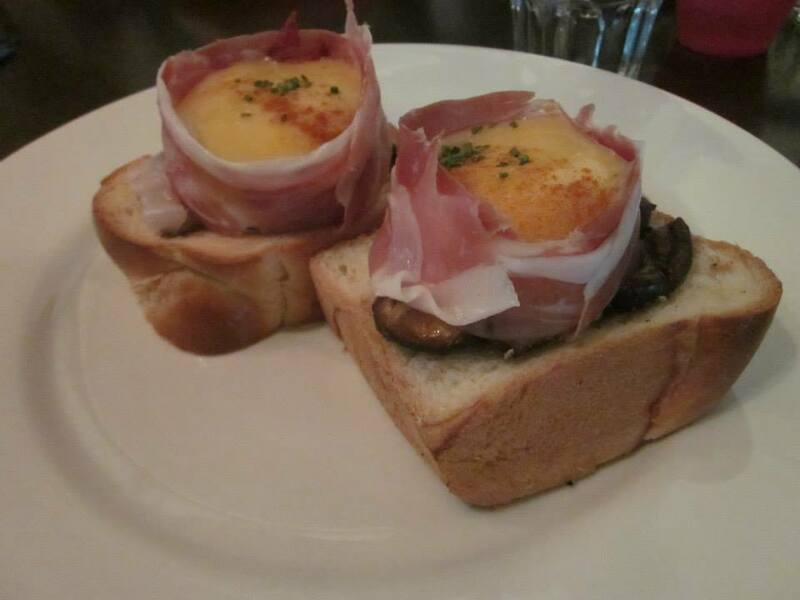 The eggs were yummy and the portions were quite satisfying too! I found the price to be a bit steep though. I always find it a struggle to pay so much for …..eggs!! And was feeling the pain all the way back home …. went budget for the next few meals!! But guess it takes a lot of technique and skill to poach eggs. 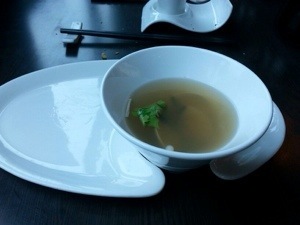 I have to mention that my food took a little long and to make up for that, they gave a complimentary mushroom dish. I thought that was a really sweet gesture and was timely to appease a customer who was starting to wonder if they forgot her food. If only all restaurants can have this policy! I do not like waiting too long for my food and I can recall some past experience where I had to wait long for my food and it made the dining experience unpleasant. This is what we ate. I was in a super non-camera mood that day so did not take even one photo. These photos were taken by Angeline. A pity I did not get a picture of the pretty and yummy strawberry cake that I ordered for dessert.